Those of you itching for mobile street battles don’t have to wait much longer, as Capcom’s premier fighting franchise Shōryū-ken’s its way on to the iPhone and iPod Touch. If you’re a fan of the one of the recent DLC characters in SF4, you are in luck, as Capcom says the iPhone/Touch will feature a roster yanked from recent console releases including classic and newly introduced fighters. “This is Street Fighter 4 in all its glory, uncompromised and awesome. You will control your fighters using an onscreen d-pad, or “Virtual Pad” as Capcom calls it. As an added bonus players can fully customise the interface by moving the buttons and d-pad anywhere on screen through use of the options menu, with which even the transparency level can be set. For newcomers or those who lack the necessary skill to master SF4, Capcom includes a new “Dojo” mode which will help unleash the fighter within turning skilless latecomers into SF4 masters. 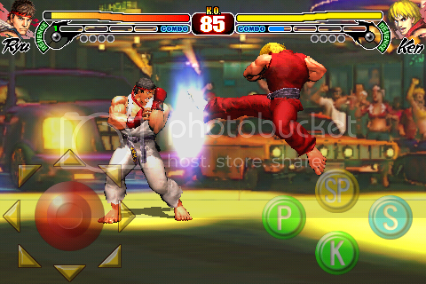 Street Fighter 4 will be available from Apple’s App Store this March.